Tuatara (Sphenodon punctatus), originally uploaded by EcoSnake. To honor Charles Darwin on the 200th anniversary of his birth. The tuatara lives only on some islands and nature preserves in New Zealand. They are not lizards but rather members of an order of reptiles which have descended mostly unchanged from before the age of the dinosaurs, some 225+ million years ago. 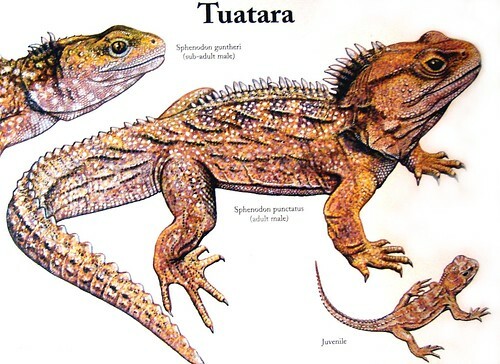 Photo of a poster of the tuatara by noted wildlife artist, Tel Hicks.